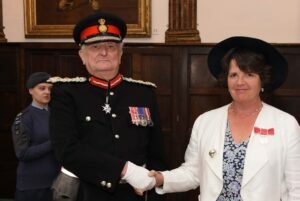 The Lord-Lieutenant, Viscount De L’Isle MBE, held an investiture at Penshurst Place for the six British Empire Medal recipients nominated in Her Majesty The Queen’s June 2018 Birthday Honours List. 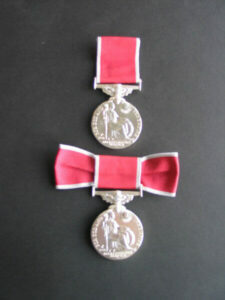 Chosen for their outstanding and dedicated community work and public service the 6 recipients, Reverend Marina Jeffrey-Watson (Birchington); Mr Ewen Kellas (Tonbridge); Mrs Diana Knox (Wrotham); Mrs Dorothy Mcgovern (Folkestone); Mrs Shelley Phillips (formerly from Tonbridge); and Dr Agimol Pradeep (Ashford) were named in The Queen’s Birthday Honours list after the medal was reintroduced in the Diamond Jubilee year. The Ceremony took place in the Sunderland Room where guests of the recipients were able to witness the Ceremony. 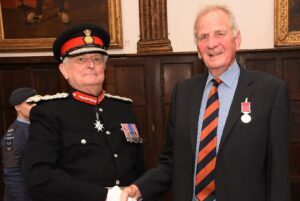 The short citations were read by Mr Douglas Horner, a Deputy Lieutenant and one of the Lord-Lieutenant’s Cadets, Cadet Flight Sergeant Sophie Parker from 2520 (Tonbridge) Squadron, Kent Wing Air Training Corps also assisted the Lord-Lieutenant during the Ceremony. Reverend Marina Jeffrey-Watson receiving her medal from the Lord-Lieutenant. (c) Barry Duffield DL. Reverend Marina Jeffrey-Watson began her working life as a Community Nurse. She later became a Minister and dedicated her time to looking after those in need in the local community. She established a Lunch Club 26 years ago which ensures the more vulnerable members of the area can meet regularly in a caring environment, giving them much wanted friendship and support. Pictured right, Mr Ewen Kellas. (c) Barry Duffield DL. Mr Ewen Kellas has served the community of Horsmonden for over 40 years. He established a youth club where he taught table tennis, cricket and football. He was instrumental in reviving the Working Men’s Club which now enjoys a thriving membership. He also helps organise the annual village Fete and arranges litter picking and path clearing sessions. Mrs Diane Knox receiving her medal. (c) Barry Duffield DL. Mrs Diana Knox has been a tireless fundraiser in the village of Wrotham for over 15 years. She established the Friends of St George’s Church Committee which hosts fundraising events to help maintain the church. They have raised enough funds to install a new lighting system, restored the bells and are now looking to repair the roof. 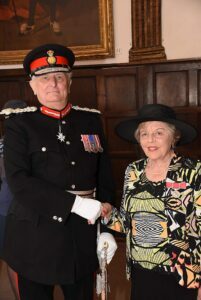 Mrs Dorothy Mcgovern being congratulated by the Lord-Lieutenant. (c) Barry Duffield DL. Mrs Dorothy Mcgovern has been an active member of the community in Folkestone for nearly 25 years. She is a Stroke Nurse but still manages to find time to serve on numerous groups to support disadvantaged people. She created the Hill Road Community Garden which transformed a dilapidated area into a beautiful garden for people to enjoy. She has raised over £50,000 for Stroke and Cancer charities. 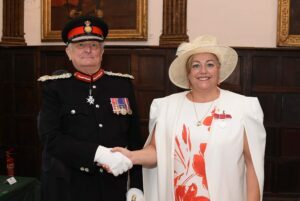 Mrs Shelley Phillips pictured with the Lord-Lieutenant. (c) Barry Duffield DL. Mrs Shelley Phillips has spent over 20 years hosting concerts to raise funds for various charities and has, so far, raised over £50,000 for the Hospice in the Weald and over £20,000 for Demelza Hospice Care for Children. 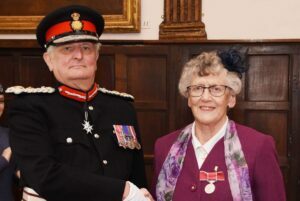 She was also instrumental in encouraging the local community to help raise over £75,000 for specialist equipment for a local resident after they had suffered a severe stroke. 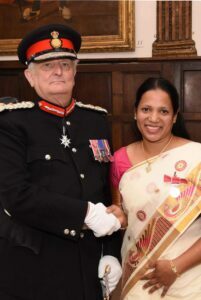 Dr Agimol Pradeep being congratulated by the Lord-Lieutenant. (c) Barry Duffield DL. Dr Agimol Pradeep has made a significant impact in increasing the number of people from Black and Minority Ethnic backgrounds to join the organ donation register. She has given talks at numerous events, including faith festivals, fetes and workshops to explain the importance of organ donors coming forward from the BME community. Her work in this area has been hugely successful as the number of donors on the register has now increased by 4500.